If you’re reading this, chances are sky high that you are a devout Washington Wizards fan, and you are longing for some exciting news in the month of August. You’ve enjoyed following JaVale McGee’s music career along with the big news that he will be playing with the USA Basketball team. You got excited when John Wall said he was coming back to DC, after spending some time in North Carolina, and it made you want to watch highlights to whet your appetite. You learned more about Yi Jianlian, you waxed nostalgic about Antawn Jamison, and you felt teased when only the preseason schedule was released. Well my Wizards fans, long no more … the 2010-2011 schedule is here for your viewing pleasure. But surely you didn’t think we were just going to list the schedule, and then let you navigate it all alone did you? Here at Truth About It, we are absolutely dedicated to breaking down the significant match-ups, the upcoming, compelling stories, and the must-see-TV moments that will make this 2010-2011 season one that you will not and cannot miss. We also have nothing else to do until McGee and the rest of the USA ballers play on Thursday night. Since January, the Wizards and Magic have been mentioned in an alleged Gilbert Arenas for Vince Carter swap. It’s only August, anything can still happen. If these teams pull the trigger, it could make for quite an interesting opening night. If not, we still have John Wall/Jameer Nelson, JaVale McGee/ Dwight Howard, and Yi Jianilian/Rashard Lewis match-ups to anticipate. The home opener against the 76ers give us two reunions of sorts. The first is between Wall and Evan Turner. They went one and two respectively in the 2010 NBA draft, and prior to their workout in the Chicago pre-draft camp, they briefly played one-on-one. No word on who won that match-up. Wall outplayed Turner during Summer League play, both players will surely have something to prove during their first official meeting. The second reunion that night will be the return of Doug Collins. Collins coached the Wizards from 2001-2003, and led them (along with Michael Jordan of course) to two 37-45 seasons. Ironically enough, the last game Collins coached for the Wizards, was a 107-87 loss to Sixers in Philadelphia on April 16, 2003. That was also Michael Jordan’s last game as a player. Last month in Las Vegas, Wall led the Washington Wizards to a 88-82 victory over the Dallas Mavericks, by scoring 21 points, dishing out 10 assists and grabbing seven rebounds. But in the fourth quarter of that game, he was severely outplayed by Jeremy Lin, then an unsigned rookie out of Harvard. Lin scored 11 points in the fourth quarter, and nearly led the Mavericks to a comeback victory. That performance alone had the Lakers and the Mavericks interested in Lin’s services, but he settled on the Golden State Warriors. He definitely won’t be starting, but if Coach Don Nelson is smart, he’ll give Lin some run during these games. Although, Wall vs. Monta Ellis might be fun too. This will be Wall’s first time playing in his home state as a professional. He could cry at the number of ticket requests he gets, he could cry during the national anthem or he could shed tears of joy after dropping 40 points on Shaun Livingston, D.J. Augustin and Dominic McGuire. You never know how these things will go. >>Former Wizards Return to D.C.
Arenas has been laying low all summer, but starting with training camp, and the approaching season, he will eventually come up for air once again. Will he be a relaxed, fun guy? Or will he be reserved and reflective like he was during Media Day last year? No matter which Arenas we see off the court, it will be very interesting to see the type of reaction he gets both home and away. 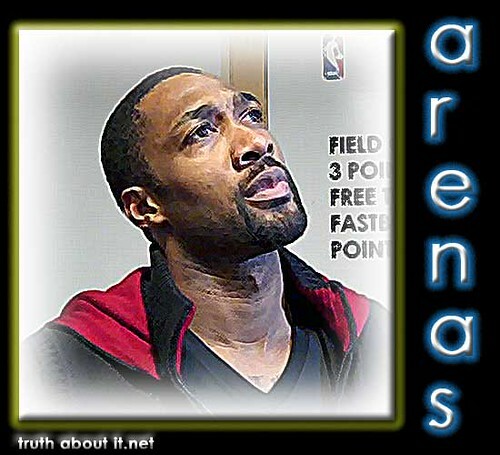 Home opener…Will Arenas take the mic and apologize a la Antawn Jamison? Last year, there were rumors swirling about how the personal lives of Shaquille O’Neal and Gilbert Arenas. However, when Cleveland came to town in November, Coach Mike Brown told the media, Shaq stayed home “to rest.” When the teams met again on Jan. 6th, Shaq was healthy and available, but Arenas had just been suspended indefinitely by David Stern. Arenas is un-suspended, Shaq is rested, healthy and in Boston, and those rumors have now quieted. Still, this should be interesting. The last time Arenas played in LA, he scored 60 pts, and Kobe Bryant said that performance was filled with “lucky shots.” Kobe’s won two titles since then, Arenas’ game hasn’t been that potent since. Between Nov. 13 and Dec. 18, the Wizards play 14 games, nine of which are on the road–which includes an 11 game stretch where they alternate between home and away games. Six of those nine games are against playoff team (the Bulls, Celtics, Hawks, Heat, Suns and Lakers). 11 of their last 17 games are also on the road, which includes a five games in seven days stretch where they play the Blazers, Clippers, Nuggets, Warriors and Jazz. If the Wizards are in the playoff hunt, they will have to earn that berth with solid play on the road. Andray Blatche is out with a foot injury, so we don’t know the exact date of his return. But based on this interview with washingtonwizards.com, his goal is not to miss any preseason time at all. If that holds true, he’ll be in the starting lineup on Nov. 17, and he’ll face off against the Celtics’ Kevin Garnett in Boston. Last year Blatche called Garnett washed up, and the Wizards choked away a late-season win on March 7 in Boston, but came back and handed the Celts a beat-down on April 9. Blatche is now a year older and improving, Garnett is a year old and declining, but both players should be up for the challenge. Chinese natives Yi Jianlian and Yao Ming will go head-to-head for the fifth time. Yao has dominated this series in both wins (4-0) and stats (21 points, 12.5 rebounds and 3.0 blocks for Yao; 10 pts, 7.5 rebounds for Yi). Hilton Armstrong (1984) and Trevor Booker (1987) have the luxury of celebrating their birthdays at home. Jan. 25 – vs. Denver >> Melo in D.C.
Baltimore-product Carmelo Anthony makes his annual appearance in Washington D.C., and since he’s a free agent at the end of the 2010-2011 season (he hasn’t signed an extension so far), Wizards fans will likely have this game and this game only for an informal pitch. Anthony has hinted at playing with the Knicks (and not the Wizards), but LeBron’s “Decision” has showed us that anything can happen. This may be a root for the Wizards and Carmelo, but not the Nuggets situation. Mar. 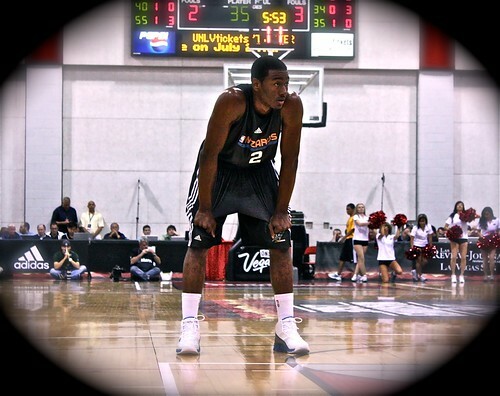 14 – vs Oklahoma City >> Return of K.D. D.C. native Kevin Durant was also slated to be a free agent at the end of next season, and Wizards fans fantasized about him playing in the Verizon Center. Unfortunately for them, Durant signed a 5-year extension with Oklahoma City, and made the announcement via his Twitter page. I wonder if that’s enough to earn him some boos. Nah. You can enjoy Wizards play the Hawks in Atlanta on a Thursday night as you recover from your Thanksgiving feast. You can watch them take on former Georgetown Hoyas center Roy Hibbert and the Pacers in Indiana at 3 pm (est) on New Year’s Eve Friday. Then, as you sober up and eat on New Year’s Day, you can watch John Wall take on Chris Paul and the New Orleans Hornets at 7 pm on the first night of next year.